Peter Orszag, Social Security Benefit Cutter? Not really. This says something about the popular left, where even being open to some benefit reductions for high earners is considered heresy. In any case, though, there's a lot less to this than meets the eye. The reason is that the Diamond-Orszag proposal was actually much less balanced regarding tax increases and benefit cuts than you'd think. The following table is derived from the SSA actuaries analysis of the Diamond-Orszag proposal, with some additional cost breakdown by me. It divides the effects on the program's actuarial balance of the different components of the plan. In total, the plan improved the system's 75-year actuarial balance by 2.46 percent of payroll, which is equal to 128 percent of the total deficit. The Diamond-Orszag plan seemingly "overshoots" but in fact this is because, like many other plans, it aims to be "sustainably solvent" beyond 75 years. I've categorized each provision as either a tax increase or a benefit reduction. One provision is neutral with regard to cost, while interactions between different provisions improve the actuarial balance by around 0.2 percent of payroll. Since interactions can't easily be attributed to either tax increases or benefit cuts, I've ignored them here. Around 84 percent of the Diamond-Orszag plan's 2.26 percent attributable improvement in the actuarial balance can be ascribed to tax increases and 16 percent to net benefit reductions. In other words, "balanced" doesn't imply 50-50, or really anything even close to that. The tax increases by themselves are almost enough to fix the 75-year shortfall. While certain people get benefit cuts, there are also a lot of benefit increases in the plan as well. Now, I'd guess that Orszag would be open to reasonable compromises that differ from his preferred approach, and I'd hope that President Obama would listen to the advice that Orszag gives to him. But the good news for readers of the Progressive and others of that inclination is that Peter isn't nearly as gung-ho on benefit cuts as the article would imply. This paper reviews why Social Security fails to lift more aged low-wage workers and people of color out of poverty. It examines the payroll tax and benefit formula and reviews literature about OASDI outcomes by race, gender, and earnings level. It describes how mortality, earnings, disability, childbearing, immigration and emigration, and marriage patterns all differ across U.S. racial/ethnic groups, and highlights the importance of these differences for program outcomes. The paper then uses the DYNASIM model to examine lifetime OASDI redistribution under current law and a trust fund-neutral reform package that would enhance system progressivity and improve outcomes for some vulnerable to retirement poverty. In addition to being a good summary of existing research on who does well and who does poorly under Social Security – and why – Favreault and Mermin present a number of potential reforms to Social Security to reduce poverty among seniors. Definitely worth a read. The chart below illustrates. As can be seen, average replacement rates decline as lifetime earnings increase – this shows that Social Security is generally progressive. However, the distribution of replacement rates at any given level of lifetime earnings can be pretty wide, especially for low earners. Some do really well, others do pretty poorly. If Social Security is to be successful as social insurance, it needs to pay off consistently. There are a number of ways, including those discussed by Favreault and Mermin, to improve the targeting of Social Security benefits by earnings level. If Social Security's progressivity were better targeted, the same amount of average progressivity could produce better protections for low earners in old age. Update: An anonymous commenter asks, "The problem you note may be related to the disparate way benefit formulas apply to couples in general. The chart would probably look more equitable for wage earners only. Is the way we treat couples still as relevant as it was in the 1930's?" It's a logical point but turns out not to be the case. Social Security benefits are better targeted at a household level than an individual level. The chart below differs a bit from the one above (it shows data points rather than interquartile ranges), but the dispersion in replacement rates by lifetime earnings is significantly higher at the individual than the household level. 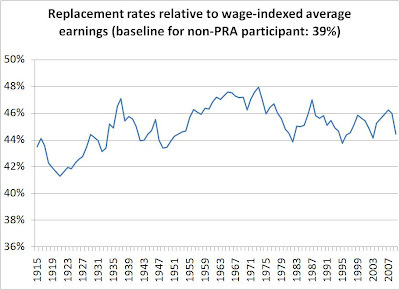 One way to look at is to measure the R-squared values of a regression of replacement rates on lifetime earnings. At the household level the R-squared value is around 0.55, which indicates that around 55% of differences in replacement rates can be accounted for by differences in lifetime earnings. (Given that Social Security is designed to redistribute by lifetime eranings, this strikes me as a lower value than you'd want.) At the individual level, however, the R-squared is only around 0.3; this indicates that 70 percent of differences in replacement rates between indivduals are due to things other than differences in their lifetime eranings. This again strikes me as very haphazard given that we're trying to target low earners. Argentina nationalizes pension accounts; will U.S. follow? In a move discussed here, Argentina passed legislation proposed by President Cristina Kirchner to seize private social security pension accounts held by citizens in order to ease budget pressures on the government. Leaving aside how the account holders felt about it, the markets rendered their own judgment: despite central bank intervention the Argentinean peso fell, and Argentine stock markets declined as well. See this story for more details. "Social security can't depend on the risks of the financial system and speculation," said Senator Fabian Rios of the ruling Peronist party. Sounds like something we'd hear here in the States. Yet, bear in mind that account holders were previously given incentives to voluntarily turn in their accounts to the government, but they strongly chose with financial risk over political risk. Now, those choices have been overturned. Leaving aside what this says about Argentina's government – nothing good, in my view – Argentina's move to nationalize pension accounts bears much too close a resemblance to this for my comfort. Increases in immigration tend to improve Social Security's financial status, and decreases in immigration tend to worsen it. More immigration would likely eliminate only a small portion of Social Security's long-term shortfall. The impact of immigration on Social Security's finances is modest and should not be a major factor in setting either immigration or Social Security policy. The whole piece is well worth reading. Paul was the Assistant Deputy Commissioner for Policy at the Social Security Administration at the time I was the Associate Commission for Retirement Policy, which pretty much made Paul my boss (and a good boss, smart analyst and overall great guy he is). I don't disagree with Paul's conclusion that immigration has a modest positive impact on Social Security financing, although I also wouldn't be surprised if in the future we concluded the positive effects were modest or even slightly negative. The reason is that modeling of immigration's effects on Social Security is still a work in progress, so I don't feel 100 percent confident in the results currently out there. Paul notes that immigrants differ from native born in a number of ways – earnings, fertility, mortality, and so on. Unfortunately, the current modeling of immigration by the Social Security Trustees doesn't really capture these differences: immigrants are assumed to have the same earnings and life expectancies as native born, so in a sense they're treated as equivalent to an increase in the birth rate even when they might not be. CBO's modeling of immigration is better, in that their model better captures the earnings of immigrants – a large number of low earners coupled with a small number of high earners. A big issue that both SSA and CBO are now better capturing is the effect of immigrants who come to the U.S. but later leave. Many of these folks will leave "stranded taxes," meaning they paid taxes while here but won't be around to collect benefits. I suspect SSA somewhat overestimates the positive effects of these immigrants, since assuming they have the same earnings as native born will both reduce the rates of return of those who stay through retirement, as well as increasing the amount of stranded taxes from those who return home and don't collect benefits. Here's a general analytical crutch I use when thinking about immigration and Social Security financing: imagine that immigrants and their offspring (kids, grandkids, etc.) formed a separate Social Security system in which they paid taxes and later collected benefits. For immigration as a whole to benefit Social Security financing, this separate Social Security program for immigrants need to be more than solvent, collect more in taxes than in pays in benefits, even over the long term. Initial immigrants are likely money losers, since they tend to have truncated careers, low earners, and longer life spans. If these folks receive internal rates of return in excess of the trust fund bond rate – around 3 percent over inflation – this implies that they pay less into the system than they collect from it (in present value) and, as individuals, they probably hurt solvency. But immigrants tend to have more kids than native born, meaning that they generate additional tax payers in the future. The question here is what the next generation looks like, in terms of their earnings, fertility, disability incidence, mortality, and so on. Assuming the first generation of immigrants may be money losers, this next generation needs to be money producers for the program. I don't know what the answers are here. In any case, I think Paul basically has it right, but there's more to be done on the technical side and I wouldn't be too surprised to see some slightly different results in the future. The Cato Institute's Jagadeesh Gokhale takes on a defense of the current social security program by University of Missouri-Kansas City professor Max Skidmore in this post at Cato @ Liberty. Worth checking out regardless of which side you're on. The recent financial crisis and ensuing stock market gyrations have drawn renewed attention to Social Security reform, in particular proposals to establish personal retirement accounts that invest in stocks and bonds. As Barack Obama asked a campaign audience, "Imagine if you had some of your Social Security money in the stock market right now. How would you be feeling about the prospects for your retirement?" But despite the recent market downturn, individuals investing four percentage points of the 12.4 percent payroll tax in a personal account holding a "life-cycle" portfolio and retiring today would have increased their total Social Security benefits by more than 15 percent. Moreover, a simulation of ninety-five cohorts of individuals retiring from 1915 through 2008 found that all of them would have increased their total Social Security benefits by holding personal accounts. These results are not intended to understate the risks of equity investment, but rather put them in perspective. Some analysis has overstated the importance of returns over a short period of time relative to those over the full course of a working lifetime by looking at declines in stock returns over only the last year. While individuals retiring today may have ended with a lower account balance than they expected, they would nevertheless have significantly increased their total retirement benefits by virtue of choosing to participate in a personal retirement account. First, a relatively simple simulation of a stylized personal account plan against stock and bond returns from 1871 through November 4, 2008. This modeling shows that all cohorts with personal accounts would have increased their total Social Security benefits, by an average of around 15 percent. Second, a discussion of how the results from this analysis differ from similar simulations by Robert Shiller of Yale and Gary Burtless of the Brookings Institution, both of whom come to different conclusions than I do. The paper shows that Shiller's paper's methodology dealing with historical market returns tends to overestimate the number of account holders who would fail to "break even" by holding an account. Burtless's work simulates (in essence) IRA or 401k plans invested in stocks, not a Social Security reform plan where accounts are integrated with the rest of the program. As you model reform plans more closely, many of Burtless's results fall away. Third, a broader theoretical discussion of stock returns, personal accounts and Social Security reform. This draws some important caveats on the data-driven work in the paper and notes that personal accounts might best be viewed as a saving tool, not as a means to get higher returns via investment in equities. I'll try to post the data and calculations in an Excel file later today. New paper: How Much Risk is Acceptable? The financial crisis has sparked proposals to reform the retirement income system. One component of such a system could be a new tier of retirement accounts. These accounts would augment declining Social Security replacement rates for low-wage workers and provide a buffer of security for middle- and upper-wage workers who, increasingly, will rely totally on 401(k) plans to supplement their Social Security. Designing such a new tier requires answering a number of questions: Mandatory or voluntary? Employee and/or employer contributions? Subsidies for low earners? Payments as lump sums or annuities? Tax favored or not? But the most fundamental question is whether the goal of the new tier is to provide a defined contribution account, where the retirement income will depend on market performance, or an account that can provide a certain percent of final earnings – that is, a target replacement rate. This brief takes the first step in exploring the question of how much risk is acceptable. The first section makes the case for a new tier of retirement income. The second section describes the implications of using a defined contribution approach for the new tier. The third section uses a model developed by Gary Burtless to demonstrate that even using target date funds and full annuitization at retirement, a defined contribution approach produces enormous variation in outcomes. The fourth section explores the implications of modifying these fluctuations. The final section concludes. Washington Times on a number of options available to the new Congress to address the rising costs of entitlement programs. Concord, Heritage and Brookings have all been participants in the Fiscal Wake Up Tour (which I've been happy to take part in on occasions). Washington may bail out Wall Street. But who will bail out Washington? Sure, foreign investors have been bailing out Capitol Hill for years - pouring billions annually into "safe" government securities. But how much longer will they do so? And at what price? We all know the pragmatist's version of the Golden Rule: He who has the gold, rules. Do we really want to be in hock to China to the tune of trillions of dollars? Fiscally speaking, the U.S. government has been living on borrowed time for decades. It has promised massively expensive benefits - mainly Social Security, Medicare and Medicaid - heedless of the enormous tax burdens these promises implicitly place on our children and grandchildren. If you think saddling taxpayers with a $700 billion bailout was extravagant, consider that taxpayers will have to cough up more than 50 times as much to cover the unfunded liabilities of Medicare alone. Medicare currently faces a long-term funding gap of $36 trillion. That's trillion with a "t." For more than two years, now, the three of us have crisscrossed the country on a "Fiscal Wake-Up Tour, warning of a pending fiscal inferno fueled by unsustainable "entitlement" promises - especially those of Medicare. In more than 40 cities, we've presented the numbers and the graphs that prove we must fundamentally reform these programs. Otherwise we will leave our children and grandchildren with a staggering financial burden. And in more than 40 cities, people get it. They understand the need and want serious action now. But just as Americans are recognizing the need to recast Medicare, along comes a seductive idea suggesting a different, less difficult solution. "We don't really have a fiscal problem," the argument goes, "We have a health-care problem. Medicare's rising cost mainly reflects rising per-person health costs. So don't worry about Medicare; just fix the entire health-care system." This argument is misleading for several reasons. For starters, a big chunk of Medicare's $36 trillion long-term funding gap occurs because the number of beneficiaries will almost double over the next 20 years. Yes, growing costs per beneficiary may play the larger role. But you can't simply ignore the fiscal wallop of this demographic reality. Second, most proposed system "fixes" - from more use of electronic medical records to more emphasis on prevention and coordinated care - would save relatively little money. Those most likely to save big money - such as changing practice patterns to better reflect evidence about what works - would take decades to implement. That's time we can't afford. Third, Medicare reform could, itself, help reform the entire health system. Medicare is the system's biggest customer, paying roughly 20 percent of the nation's total health-care bill. Other federal programs cover another 13 percent. That kind of market share positions the federal government to lead us toward a more efficient health system by collecting data on what works and reimbursing providers in line with evidence on effectiveness. Medicare has led before and can do it again. Why hold Medicare reform hostage to a global "fix" of health care? Use Medicare to leverage wholesale change in reimbursement policies, encourage use of electronic medical records, and experiment with new health-care delivery methods. Also, institute competitive bidding on medical equipment for home-based seniors; it would save huge sums. Reduce the commitments we've made - seriously, but fairly. For example, premiums for Medicare Parts B and D, which mainly pay doctors' bills and prescription drugs, cover only 25 percent of these program costs. Reducing premium subsidies for upper-income seniors would help dig us out of the hole while protecting truly needy seniors. Look for savings in Medicare payments. One place to look: the increasingly popular Medicare Advantage program. It provides extra benefits by paying private plans 13 percent more per beneficiary, on average, than traditional fee-for-service Medicare. Finally, put Medicare (and Social Security and Medicaid) on a budget, with automatic "triggers" to make sure spending stays within budgeted amounts. Currently, all this spending increases automatically, year after year, with no set limit. If the Wall Street crisis has taught us nothing else, it has shown there are financial limits - even for America. Unfunded financial promises will one day fall due. With a vengeance. Health-care reform is a good and noble goal. But if we do only that - without fundamentally redesigning the Medicare commitment - our grandchildren will inherit a crushing financial burden. I looked at the question of rising per capita health care costs versus the rising number of health care beneficiaries here. Overall, I found that around half the total cost increases in Social Security, Medicare and Medicaid are due to population aging, with the other half due to rising per capital health costs. While this doesn't necessarily mean that any solution must be "half and half" – meaning half traditional fixes such as raising the retirement age, and half structural fixes to health care financing – it does imply that we should pay attention to both sources of the problem. Thomas S. Terry, the Academy of Actuaries' vice president for pension issues and CEO, JP Morgan Compensation and Benefit Strategies. Anna Rappaport, chairperson of the Society of Actuaries Committee on Post-Retirement Risks, a senior fellow on pensions and retirement for the Conference Board, and a past president of the SOA. S he is president of Anna Rappaport Consulting in Chicago. Ken Buffin, a former chairperson of the Academy's Social Insurance Committee and a principal in Buffin Partners in Sparta, N.J.
Haeworth Robertson, chief actuary of the Social Security Administration from 1975 to 1978. He is the 2004 recipient of the Academy's Robert J. Myers Public Service Award. Update: Here's something I think is worth pointing out: three of the four actuaries propose a universal flat Social Security benefit paid to all seniors, regardless of their prior earnings or labor force participation. This is interesting given that Social Security benefits have always been tied to work and taxes paid. The idea they're proposing is similar to so-called "universal pensions" such as those in New Zealand. These universal pensions would be supplemented with an earnings-based second level benefit. I've done some work in this area which should be forthcoming over the next month or so; there are pros and cons to universal pensions and it would constitute a big shift from Social Security's traditional approach, but they would also address some shortcomings to the current method of providing retirement income security. Automate participation and savings. Automatically enrolling employees in plans, then hiking savings with pay raises, overcomes the inertia that results in nearly a quarter of workers eligible for an employer-sponsored retirement plan not signing up. Automatic enrollment plans should mandate employer and employee contributions, and the percentage amounts of each. That's the approach some higher-education retirement plans follow. It may be one reason why 35% of faculty feel very confident in their retirement income prospects, compared with 25% of working Americans, according to the TIAA-CREF Institute. Give workers the information they need. Most of us need advice that is objective -- from an adviser who receives no sales commission and thus has no incentive to push particular products -- and tailored to our individual goals. Retirement plans must include such advice for everyone who signs up. Guarantee an income floor. Many retirement accounts focus on accumulation, but fail to include a payout mechanism to ensure retirees will not outlive their savings. Retirement plans should provide that by automatically converting all or a portion of the account balance to a low-cost annuity at retirement. Encourage health-related savings. According to the Employee Benefit Research Institute, a couple that retires today will need from $200,000 to $635,000 to pay out-of-pocket health-care costs (above Medicare). Few private-sector employers offer workers an account to save for such costs. Last year's agreement among the Big Three automakers and the United Auto Workers to establish tax-free trusts for worker health is an approach gaining favor among academic institutions. Now Congress needs to enable people with these accounts to leave any unused balance to heirs. This will encourage people to hold on to their savings until the last years of their lives, when health-care money is most needed. Diversify risk. If you had all your retirement in stocks, your account lost about 40% in recent weeks. If you had a mix of stocks and fixed-income holdings, you're down about 20%. Individuals need to properly diversify, and rebalance their accounts regularly to maintain a prudent mix of assets. All good suggestions. Click here to read the whole article. Could the USA lose its AAA bond rating? Some say that with rising debt levels – the financial bailout built up projected increases due to entitlement costs – the U.S. Treasury could eventually lose its AAA rating on government bonds, which would imply higher interest rates for the government and for all Americans. This story on CNBC discusses the issue. Analysts from the major bond rating agencies – Moody's and Standard & Poor's – raised the issue of sovereign debt downgrades even before the financial crisis hit, solely based on rising costs for Social Security and Medicare and the government's seeming inability to address them. How would this matter? Two ways. On one hand, a bond downgrade might finally spur Congress to action, as the first concrete evidence of the cost of our failure to address rising entitlement costs in a timely way. But on the other hand, if falling bond ratings imply higher interest rates, this would have a paradoxical effect on the measured Social Security and Medicare shortfalls: they would go down. The reason is that the Social Security and Medicare deficits are calculated as "present values," which means that future dollar deficits are discounted back to the present using the government bond interest rate. For example, at the current assumed long-term interest rate of 2.9% above inflation, a Social Security deficit in 2080 of $500 billion has a present value of $64 billion. Now let's assume that Treasury bonds are downgraded and must now pay a higher interest rate – say, 3.9% above inflation. In that case, the same $500 billion real dollar deficit in 2080 now has a present value of only $32 billion. Now, this is only accounting make-believe – the deficits are what they are, and the fact that we discount them as government interest rates that may rise as a result of our fiscal profligacy can't possibly make them smaller. But given Congressional inclinations to make no hard choices for as long as possible, surely someone would grasp onto this accounting curiosity as a reason to continue to do nothing. This highlights the important role of how we measure entitlement costs, and how those measures affect what we see and what we do about it. Social Security provides monthly benefits to qualified retirees, disabled workers, and their spouses and dependents. Until 1984, Social Security benefits were exempt from the federal income tax. In 1983, Congress approved recommendations from the National Commission on Social Security Reform (also known as the Greenspan Commission) to tax Social Security benefits above a specified income threshold. Specifically, beginning in 1984, up to 50% of Social Security and Railroad Retirement Board (RRB) Tier 1 benefits are taxable for individuals whose provisional income exceeds $25,000. The threshold is $32,000 for married couples. Provisional income is defined as the total income from all sources recognized for tax purposes plus certain otherwise tax-exempt income, including half of Social Security and RRB Tier 1 benefits. The proceeds from taxing Social Security and Railroad Retirement Tier I benefits at the 50% rate are credited to the Old-Age and Survivors Insurance (OASI) trust fund, the Disability Insurance (DI) trust fund, and the Railroad Retirement system respectively, based on the source of the benefit taxed. In 1993, Congress passed a second income threshold for the calculation of taxable Social Security and RRB Tier I benefits. This second threshold (often referred to as Tier 2) taxes up to 85% of benefits for individuals whose provisional income exceeds $34,000 and for married couples whose provisional income exceeds $44,000. The tax proceeds from the second tier goes to the Medicare Hospital Insurance (HI) Trust Fund. Income from taxation of benefits to the Social Security trust funds totaled $18.6 billion in 2007, or 2.3% of its total income. For Medicare, income from taxation of benefits totaled $10.6 billion in 2007, or 4.7% of total HI trust fund income. Because the income thresholds to determine the taxation of Social Security benefits are not indexed for inflation or wage growth, the share of beneficiaries affected by these thresholds is expected to increase over time. According to the Congressional Budget Office (CBO), 39% of (or 16.9 million) Social Security beneficiaries were affected by the income taxation of Social Security benefits in 2005. In the 110th Congress, legislation has been introduced that would impact the taxation of Social Security benefits, including H.R. 2, H.R. 191, H.R. 192, H.R. 1349, H.R. 2158, H.R. 2507, H.R. 6677, and S.Con.Res. 21. This report will be updated as warranted by legislative activity. Since 1999, the Social Security Administration (SSA) has mailed an annual Social Security Statement to individuals aged 25 or older showing their reported earnings history. The Statement also provides workers with estimates of benefit amounts available under the Social Security programs. This note focuses on estimates of retirement benefits in the annual Social Security Statement. Estimated benefits are adjusted for economy-wide average wage growth from about the time of Statement issuance to about the time of retirement. In addition, the Social Security Statement uses certain assumptions about current and future individual earnings to estimate retirement benefits. This note evaluates whether the Statement's assumptions produce accurate estimates, using data from a sample of recently eligible retired workers in SSA's Modeling Income in the Near Term (MINT) microsimulation model. Examining statistics based on differences measured at the individual level, we find the median differences are highest at the earlier Statement ages. For example, the median percentage difference between Statement PIAs and deflated retirement PIAs is minus 16 percent at Statement age 25, but narrows considerably at later ages (around minus 1 percent to minus 2 percent at Statement ages 40 or older). Note that these are median differences, not differences in medians. A majority of sample members (57 percent) would have received Statements at age 55 with benefit estimates based on PIAs very close (plus/minus 5 percent) to their deflated retirement PIAs. Over three-quarters (78 percent) had values that were within 10 percent. Considering a 10 percent difference to be "fairly close," we note that by Statement age 40 a majority of persons have Statement PIAs fairly close to their deflated retirement PIAs. I did some work in this area several months ago and I believe the new SSA findings match fairly well with my own analysis. Both find that the projections are reasonably accurate on average, and the accuracy of the projects improves as individuals approaches retirement. The so-called "tax subsidy" of 401(k) plans comes to $80 billion a year, and its biggest beneficiaries are employees in higher tax brackets. A worker making $35,000 and paying income tax in the 15% bracket gets a $525 break by setting aside 10% of pay in a 401(k). A worker making $150,000 and paying in the 28% bracket gets $4,200 from the same 10% deferral. You can see why this irks the spread-the-wealth party. So it's no surprise that Democrats are intrigued by an alternative plan that would replace 401(k)s with a flat tax credit at all income levels. Teresa Ghilarducci, an economist teaching at the New School for Social Research in New York, explained the plan at an Oct. 7 hearing before the House Education and Labor Committee, chaired by Rep. George Miller, D-Calif. Miller invited Ghilarducci in his quest to find a replacement for 401(k)s, which he has called "a big failure in terms of providing an adequate retirement for middle-class Americans." Her proposal has also caught the eye of Rep. Jim McDermott, D-Wash., who chairs the House Ways and Means Committee's subcommittee on income security and child support. A McDermott spokesman calls the plan "intriguing." Under Ghilarducci's plan, all workers would get a credit of $600 if they invest 5% of their pay into a retirement account run by the Social Security Administration and invested solely in special government bonds paying 3% plus inflation. Existing 401(k)s would be allowed to remain, but contributions and employer matches would no longer be tax-deductible. For want of an incentive, they would wither away. I have a somewhat different take, both pro and con. On the pro side, critics are correct that current tax subsidies to 401(k) accounts are regressive and, more importantly, not optimal in terms of inducing saving. They're regressive because the size of the subsidy is tied to your income tax liability and most low-earners pay little income tax. (This regressivity at the margin doesn't particularly bother me because the overall incidence of the income tax is quite progressive.) But this set-up implies that high earners – who are most likely to save in any case – receive large subsidies while low earners, who aren't nearly as likely to save, receive none. My problem with the Ghilarducci proposal is that it would simply redistribute the current 401(k) successful toward low earners, making the net tax even more progressive than it already is. It should be possible to restructure saving subsidies so that average tax progressivity remains the same but that saving incentives at the margin are improved. But here's my real beef with the Ghilarducci proposal: a requirement to save with the government creates a captive pool of revenue that, like current Social Security surpluses, can be used to cover deficits elsewhere in the budget. It is highly unlikely, in my view, that Congress would put the new pseudo-bonds in the mandatory savings accounts "on the books," counting them as part of the publicly held national debt. As a result, I suspect these new accounts could serve to mask deficits and encourage increased spending in the non-Social Security budget, much as Social Security surpluses have done over the past 25 years. The Great Depression and the stagflation years from 1974-1983 were the most recent periods of great economic uncertainty. Few people in those years suffered under the illusion that a private savings account offers a secure foundation for a comfortable retirement. Big selloffs in the stock and bond markets persuaded most Americans that government-guaranteed pensions were valuable and well worth preserving. The recent market selloff may have the same salutary effect on voters' opinions. Social Security's problems still need fixing. But it is hard to argue that the most sensible fix will involve scaling back Social Security's basic promises in order to make room for a bigger private savings system. Since I'll disagree with Gary regarding some of the details, let me state upfront that I agree with many of his qualitative points and many of his conclusions. The stock market is volatile, Social Security accounts don't pay higher returns when adjusted for risk, and the recent market fluctuations do show the value of a combined defined benefit/defined contribution provision of pension income. In some senses, the numbers I'll present -- while a better representation of what an actual reform plan would have paid -- look too good; future returns could be lower and more volatile than in the past, so beware that past performance doesn't guarantee future results. I have written on this topic recently and have a longer paper coming out soon, but I'll try to explain here what drives the differences between Gary's results and my own. While I don't question his calculations, I believe his modeling of the accounts differs in significant ways from the structure of actual account based reform plans and these modeling differences account for much of his results. Individuals would invest 4 percentage points of the 12.4 percent social security tax in a personal account. At retirement, the account would be annuitized to produce a steady monthly income. The account would hold a "life cycle" fund that holds 85 percent stocks through age 29, declining to 15 percent stocks by age 60. Individuals are assumed to work from 21 through 64 and retire at age 65. In exchange for being able to divert part of their payroll taxes to a personal account, individuals would give up traditional benefits equal to their account contributions compounded at the government bond rate of return. This "shadow account" would be annuitized on the same terms as the real personal account, and the annuity payment would be deducted from the worker's traditional benefits. This shadow account is designed to keep the trust fund roughly neutral with regard to personal account participation. To keep things simple, total Social Security benefits would increase to the degree that the return on the real personal account exceeded the return on the all-government bond accounts. The baseline replacement rate for Social Security benefits alone is 39 percent; this is the replacement rate an individual would receive if he did not participate in an account. The average total Social Security replacement rate for an account holder is 45 percent. The interquartile range is from 44 percent through 46 percent, meaning that half the cohorts receive replacement rates in this range. The minimum replacement rate was 41 percent while the maximum replacement rate was 48 percent. First, I am modeling replacement rates from the total Social Security benefit, while Gary models only replacement rates from the account alone. Because of the interactions between the account and the shadow account, detailed below, I believe this is the only way to realistically analyze volatility of retirement income from reform proposals that could actually be considered. Second, part of the volatility in replacement rates in Gary's simulation derives not from risky stock returns but from differences in interest rates at the time the account is converted to an annuity. The annuity payment rises or falls based on the interest rate at the time the annuity is purchased. In the stylized reform plan I simulate – which again, more closely resembles actual reform plans than does Gary's approach – both the annuity from the personal account and the offset from the shadow account are calculated using the same interest rate. So if interest rates happen to be high at the time you retire, your personal account annuity would be higher, but so would the reduction in your traditional Social Security benefit. Likewise, if interest rates were low, both the account annuity and the traditional benefit offset would be lower. By itself, this eliminates a lot of risk. Third, Gary's portfolio is 100 percent stocks, while mine – following the default portfolios in most reform plans – is around 53 percent stocks on average. As a result, replacement rates would vary more in Gary's simulation than mine. Had I used an all-stock portfolio, the average replacement rate would have risen to 65 percent, with an interquartile rate of 53 to 72 percent. The minimum and maximum replacement rates were 42 percent and 108 percent. Again, people can judge for themselves whether the higher mean replacement rates justify the increased range of outcomes. The point here is not to dispute Gary's numbers, which I'm sure are correct, nor is it to argue that we should all go out and put all our Social Security money into the stock market. However, if we more realistically simulate a reform plan as it might actually be introduced in Congress, the historical results look significantly better what Gary's paper might suggest. I have my data and calculations in an Excel spreadsheet, which I'm happy to share if anyone is interested. Update: U.S. New's Emily Brandon discusses the two papers here. According to the latest report from the Social Security actuary, without new legislation, the Social Security trust fund reserves will be depleted in 2041, so benefits will have to be cut by 22 percent. That is, payroll tax revenue will continue to be available to pay benefits and will cover 78 percent of the benefits that would be fully paid if there were enough money. There are many plans to change Social Security to avoid this sudden drop in benefits. One of them, co-sponsored by Sen. John Sununu, the "Social Security Personal Savings Guarantee and Prosperity Act of 2005," reveals a lot about Sununu's approach to economic policy. This plan diverts part of the payroll tax revenue into individual accounts and calls for transfers from general revenue to Social Security to be able to continue paying full benefits. Apart from increased concern now with investing in the stock market, this plan severely increases the risk of an inability of Social Security to pay benefits. With the large deficits projected for the federal budget, these proposed transfers to Social Security may not occur. If there are no transfers, then, according to the Social Security actuary, with the Sununu-Ryan plan, reserves in the trust fund are depleted and benefits would need to be sharply cut in 2020, two decades sooner than without this legislation. If these changes don't occur, the plan calls for federal borrowing to finance the transfers to Social Security, greatly increasing the federal debt outstanding. By 2050 the additional federal debt to finance Social Security would be 93.7 percent of GDP. That would be enough to damage the ability of the federal government to borrow even if there are no other deficits, which there surely will be. While saving Social Security has not been part of this year's election debate, the issue will still be there when the next Congress convenes. It is worth noting that Sununu's approach to Social Security reform would place at risk the finances of Social Security or that of the entire federal government. I'm not a big fan of the Sununu proposal, for many of the reasons cited here, and would prefer an approach that doesn't rely so much on revenues from outside Social Security, which may or may not materialize. That said, this op-ed is clearly geared toward the election – Sen. Sununu is in a tight race with former New Hampshire government Jean Shaheen – and it's not as if Govt. Shaheen has offered anything near as specific as Sununu's plan. In other words, the only reason Diamond is able to criticize Sununu is that Sununu had the guts to put his ideas on the table – warts and all. It would be nice if all candidates from all parties were so forthcoming.